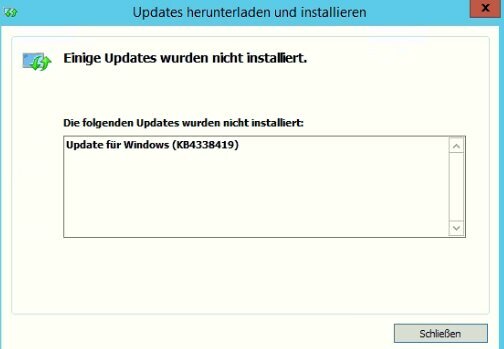 [German]Last night Microsoft released the .NET Framework update KB4340558 for Windows. As it looks, this update is buggy and cannot be installed. The installation ends (on some systems) 0x80092004. Addendum: Microsoft has published workarounds – see addendum below. .Net Framework update KB4340558 (Security and Quality Rollup updates for .NET Framework 3.5 SP1, 4.5.2, 4.6, 4.6.1, 4.6.2, 4.7, and 4.7.1 for Windows 8.1, RT 8.1, and Server 2012 R2) is available for the above framework versions. The security update is intended to fix the following vulnerabilities. The specified security fixes therefore suggest that you install this security update quickly. German blog reader Markus B. contacted me today via e-mail (thanks) and described his observation. KB4340558 is running on error. 60 PCs cannot install it. Find also already the first forum posts to it. Don’t seem like the only one. A 2nd blog reader from Greece reported the same to me via e-mail. Currently ther is only a German forum post, describing the same error. Also downloading the package from Microsoft Update Catalog and install ist manually, ends with the error dialog shown below. However, Markus B. wrote, that he received an install error code 0x80092004 (not shown above), which should be found in the event logs. Error code 0x80092004 stands for CRYPT_E_NOT_FOUND, ‘The object or property was not found’. This indicates that something was not found within the package. I assume that Microsoft broke something within the package and have to re-release a new version. So it seems that one part of the update is missing a has value, so the update installer refuse the package. PenIMC stands obviously for a pen component (Pen Input Mode Component?). 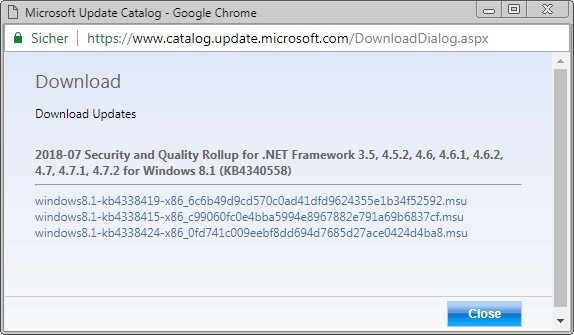 For curiosity I went to Microsoft Update Catalog and tried to download KB4340558. The goal was to analyze the package. Microsoft Update Catalog offered me three .msu packes. Blog reader Valter wrote below in a comment, that he wasn’t able to install the .msu files. There is a Russian Technet forum thread, where KB4338424, KB4338415 and KB4338419 are mentioned also. While KB4338424 and KB4338415 installs for this user, KB4338419 creates the install error. I read also some forum posts (see here at spiceworks), where users are claiming, that the update installs on Windows Server 2012 R2 without a flaw. Due to the fact, that we have a cumulative update, it’s explainable, that not all Windows 8.1 and Windows Server 2012 R2 systems will fail. Some are probably patched, while on others updating NetFx4-PenIMC fails due to the missing hash value. Addendum: At askwoody.com there is this forum post, where a user wrote, that entering the command below in an administrative command prompt windows helped. Just try it and reboot Windows. If it works, it’s fine, but I’m skeptical. Addendum: At askwoody.com user abbodi86 pointed out: ‘but running DISM is not enough, KB4229727 & KB4096417 must be uninstalled beforehand. Before I wrote the blog post, I’ve 3 different cases, where this update fails during installation on Windows 8.1 clients or Windows Server 2012 R2. After publishing the German and English article, I received another 8 confirmations of this error so far. There are also posts at Microsoft answers, at askwoody and spicework community. All approaches as using sfc /scannow and dism, to repair Windows system files and component store, or delete the update store, won’t help. Also an attempt to install the package from a download via the .msu file will fail. Currently my recommendation is to hide the update, and wait until Microsoft releases a revised patch or recommendations to fix the install issue. I’ve escalated the issue within this Microsoft answers forum thread, and I created this Technet forum thread – let’s hope that help. If you are affected, you can leave a comment. If a solution is known, also. So it may be helpful, to uninstall KB4291497 or KB4291495. On July 13, 2018 Microsoft published the article “0x80092004” error occurs and July 2018 .NET Security and Quality Rollup update KB4340557 or KB4340558 does not install after you apply June update KB4291497 or KB4291495 with workarounds for this issue (thx JR for the comment). But I should note, that I got feedback from some affected users, where Microsoft’s fix doesn’t help. Microsoft released a revised Update on July 19, 2018, see my blog post Revised .NET Framework Update KB4340558 (July 19, 2018). Some users are reporting, that this update will install without error 0x80092004. This entry was posted in issue, Security, Update, Windows and tagged .NET Framework, Error 0x80092004, issue, Security, Update KB4340558, Windows 8.1. Bookmark the permalink. 59 Responses to .Net Framework: Update KB4340558 drops error 0x80092004? I experience this problem too. On all Server 2012 R2 this update failed with the same error. Thx, I also received confirmation from spicework community that update KB4054566 is causing the same issue. I am seeing the same issue with KB 4340558 as well as KB 4054566 (Microsoft .NET Framework 4.7.2) and the logs are reporting “Couldn’t find the hash of component: NetFx4-PenIMC”. Standard cleaning of C:\Windows\SoftwareDistribution as well as DISM and sfc runs did not help. Really looks like a botched .NET rollout so we are holding back on this Patch Tuesday’s .NET changes until something new gets announced. Oh, and additionally to add: Trying to manually install the updates (with .msu and not through Windows Update/WSUS) did not seem to make any difference either for us. 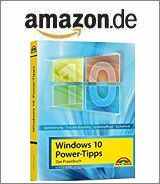 If the hash for a component is missing or wrong, the package may not be installed at all (because somebody could have altered the package – MS delivers the updates often via http instead of https. Yep, same prob on all our Server 2012 R2 installations. Strange your site seems to be one of the very few reporting this prob. Well, at least we know it’s no just us. Will check back to see if there is any news. There are multiple MSU files in KB4340558 because the .NET patches are just a wrapper around three different patches, each corresponding to a specific version of .NET. So you are likely to only see this error on OSes that have 4.6.x or 4.7.x installed perhaps? I found this out the hard way once. One of the .NET patches failed mid-install and afterwards Windows Update would no longer detect the patch as needed so I couldn’t reinstall it. I downloaded the individual MSU files and found that the first one applied and would throw the message it was already installed when I tried to apply it, the other two did not result in the same message and let me manually apply them. So the patch died somewhere in the transition between the first MSU and the second, or it failed on the second and didn’t roll back the first. Either way I ended up with 1/3 of the patch installed. win 8.1 x64 in Sweden same error update install failed have tried 10 times different install and reboot, still refuses to install. I’m seeing the same problem on 30 some servers, including VM-Guest machines. It looks like Microsoft needs to fix this. Exactly the same problem here (same update, manually from msu, resulting in same error code on Win8.1 x64). Did as advised and hid the update. Could it be that this update fails only on systems where the standard tablet input components have been disabled? Ditto. Wish I’d googled this webpage before I wasted hours on the Windows 8.1 Update Troucleshooter! So pleased that I am not the only one experiencing this issue so thank you all for posting details of your experience with this update. I hope that Microsoft corrects the error in an expeditious manner as I too have wasted time trying to install several times. Same for me, nothing worked auto/manual, so I searched on the problem which led me here. Do you think since .NET’s security updates that 3rd party security programs could be conflicting with the OS /updates? Installation of KB4340558 always fails on all my 3 Win 8.1 Professional machines with error code 80092004. Considering available posts on www I conclude the package to be faulty. Same issues here on some 2012 R2 Servers. We have 4 x 2012 R2 Servers. Only one of them has this issue but the update has installed on the other 3. Two of the servers are almost exact duplicates of each other with the same hardware and software. One of them has the issue but the other does not. Same issue here… municipal government with dozens of Windows 2012R2 servers, both physical and virtual machines running under Hyper-V. KB4340558 fails with error code 80092004 on all of them. So glad I found this to be a known problem. So the same here in NL. I experience this problem too. I have the same problem. I try to fix it with sfc/scannow on Windows 8.1 but still the error code 80092004. I gonna hide the update till we receiving an better solution. Why is Microsoft not check it on there on Computers before they send it to the people? Am living in the Philippines. Thx, I’ve added a note within the article. But I need to note, that I got some feedback from affected users, that Microsoft’s fix didn’t help. Just as a warning, maybe some affected users are lucky, whilst others will fail. Thx for feedback and glad it worked. Just for the records: I received feedback from ex MS guys, knowing the articles and my hint to take care of the uninstall preview updates. Their feedback was: It didn’t work (Win 8.1 Clients). Unfortunately I don’t know the reason for the failure. For anyone still struggling with this, installing .NET 4.7.2 and reinstalling the patch should resolve the issue. It seems the patch requires .NET 4.7.2 being installed. For Windows Server 2012 R2, the update contains the package to install 4.7.2 (KB4054566) and it is that which is failing. Checked my system and it reverted back to 4.7.1. Tried both the 4.7.2 online and offline installers with the same result. Microsoft’s workaround on KB4345232 doesn’t work, but at least installing KB4338415 and KB4338424 brings .NET 3.5 and 4.5 up to date. None of the methods above is working for me, can anyone help? I can confirm that it DOESN’T work, at least for me. Did all the steps as explained in the “solution” of Microsoft. But after uninstalling the June 2018 patch and then running DISM.exe /online /Cleanup-Image /StartComponentCleanup and letting Windows Update refind the July 2018 .Net update and trying to install that one I still get the same error as before. Some solution. Please help me get rid of this. And i try it installing these updates from MC Update catalogue and only KB4338415 cannot installs…Microsoft fix it!!!!!!!!!!!!!!!!!!!!! I had tried to install dot net 4.7.2 into my windows server 2012 r2, but end up with error has not been installed because of cannot find object or property. Repeating the methods given by Microsoft also has failed. Can anyone advise here? We all have same problem. Does MSA not know how to fix same. I was one of the lucky ones, confirming that WA2 worked for me as well. Applied today on Windows 2012 standard. The dism –> cleanup procedure has taken about 15 min. Thanks ! MS released a new version of 4338419. This will work without errors. Nothing still works for me. Did everything that’s stated. So much for a “solution” of MS.
Everything else installs just fine, except part KB4338419 from the three separate files of the whole KB4340558 patch. The other 2 install fine ( KB4338415 & KB4338424 )… still don’t know what to do. All ok as MS did an other update late Friday, All ok now. still not installing for me too..
2. First and third can be installed successfully but the second package kb4338419-x64 will fail. To resolve, remove it first. “dism /online /remove-package /packagepath:” then reinstall. (remove again if fail and redo). Restart server after successful. 3. After restarted you should be able to check Windows update that the KB is installed and left with other patch to be installed. Thanks very much YTE! Finally, after scratching my head for 3 weeks, the issue is now resolved. From Singapore, running a single Windows Server 2012 R2. YTE, a BIG THANK YOU! This solution was finally a Real Solution ! Worked like a charm. YTE thank you as well solved my dozen VM Servers that had this issue !!!! Thank you ,YTE! It worked for me as well. Thanks to YTE, now it worked! I have the same problem. Installation of KB4340558 always fails on all my 3 Win 8.1 Professional machines with error code 80092004. This was the answer to ALL my instances of this problem. And they worked for me even though I said “NO” to all reboots except the last one.